Summary: Alarmists went hysterical about the warming during the 2015-16 El Nino. In October the decline began from that spike. The climate policy debate might depend on what the world’s temperature does during the next year or so. Will the pause continue, or will warming resume? Here are several perspectives on the current warming, provided by NOAA and NASA. So it is logical that — despite the efforts of government agencies, academia, and many ngo’s — the public’s policy priorities have been unaffected (details here). Republican control of the Presidency, Congress, and most States makes policy action almost impossible for the next 4 years (ceteris paribus). As a result, activists are going thru the 5 stages of grief for their campaign. Both sides in the public policy climate wars obsess over short-term weather, even local weather. They rejoice over statistically insignificant changes in the global average temperature. They celebrate record highs and lows in obscure corners of the world. But there is a gram of sense in this, as short-term (decade long) trends have had great influence on the policy debate — and might bring decisive victory to either side (no matter what the climate does by 2050). There is no one true way to show trends in global temperature. Bob Tisdale produces a detailed monthly analysis. Here are some perspectives better suited for the general public. First, a graph by NOAA (excellent, as usual) clearly showing the trend since the reliable instrument era began in 1880. This graph exaggerates the flatness because warming is concentrated in months of May, June, & July. Click to enlarge. NOAA: Global surface temperatures for month of November. Flattish for 13 years, except for the 2015-16 El Nino spike. Despite “skeptics'” claims, there is nothing unusual about the recent cooling. It’s the commonplace downside of an El Nino spike. Despite activists’ claims, the pause (about which climate scientists have written so much) continues. For another perspective, see the lower troposphere temperatures recorded by satellites (prepared for NASA by U AL-Huntsville). The below graph is by lead scientists Roy Spencer. It tells a roughly similar story. Showing the full time series gives more detail than the above graph — with more noise. Again an El Nino spike, followed by a drop. But not yet a drop to the pre-El Nino level. Click to enlarge. Long ago Roger Pielke Sr. said that the best measure of global warming is the total heat content of the world’s oceans. He was called a “denier”. Now ocean heat content (OHC) is a consensus measure of warming used by climate scientists. NOAA posts this graph of annual OHC, showing the temperature anomaly vs. the reference period 1955-2006. OHC is little affected by the weather, and clearly shows the gradual warming since 1970. There are always bouts of extreme weather, such as the California drought now running with no end in sight. So far the pause has trumped alarmists’ stories about these events (see scientists’ papers about the pause, the debate about its causes, and predictions of its duration). But public opinion might change if the US gets hit by several at once, or some of unusual intensity, or they hit vulnerable areas. For example, we have had no landfalls by major hurricanes since 2005 — the longest such period on record. Cities from Miami to New York are absurdly vulnerable (we’ve spent our infrastructure money in Afghanistan and Iraq). Imagine if they are hit. No matter what the scientists of NOAA say the next day (e.g., time is needed for study because attribution of weather is difficult), journalists’ microphones will go to activist scientists announcing their insta-verdicts — CO2 is responsible. Previous Post The secret source of fake news. Its discovery will change America. Actually, the drought in California has improved rather significantly during the last six weeks. Another round of rain is likely in the next five days. Northern California has moved to “too wet” status. Details here: Palmer Drought Index for December 11-17 2016. Thanks for the good news! I live here and hadn’t seen it. Of course, it’s still early in the water year, too soon to draw conclusions. 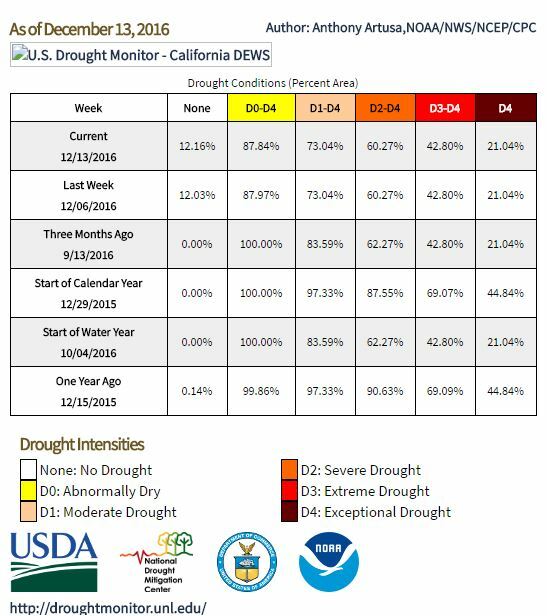 Here’s a summary from NOAA’s Drought Monitor for California. This is perhaps the key factor to watch: snowpack levels in the mountains. As of December 21 they were 64% of average for this date. Very bad news, although it is too soon to draw conclusions. See the maps here.